Ask your server about our Feature Wines! Ambiance was fine, and the staff attentive and knowledgeable relative to menu items. However prices were undeservedly high, and food quality was lacking. Adding an Italian name to a menu item does not indicate quality. We really enjoyed dining at Marzano. However, a few comments about the pizzas: not enough artichokes on the pizza, not enough cheese on another pizza. Loved the thin crust. Pork chops were yummy and so was the chicken pasta. Was excited to finally go after I heard good things from several friends. Was told they had amazing pizza and they definitely did. Never had pizza like that before and it was amazing. Everyone had a great experience. Service was fantastic so I definitely had a good waitress. Definitely recommend. Will go again when I can afford it. Tad pricy but worth it for the food and environment. This is our third time here. Service is still friendly and professional and it’s a great place to eat in. My wife’s dish of the lamb pappardelle looked and tasted great, I had the Albacore Tuna Romesco and the pasta was a bit undercooked in my view. It wouldn’t stop us from going back, but I wouldn’t have that dish again. Drinks and appetizers were great as usual. Nice location with beautiful rooms, the food was truly delicious and at a fraction of what it could have cost elsewhere. I definitely recommend! Amazing food, decor and friendly waiters. Try to make a reservation if you are planning to go on the weekend. Don't miss the gnocchi. Love the place, great food. I like it there is different seating, long tables, comfortable booth, no TV’s and music at the right noise level! Would definitely recommend this restaurant. A little disappointing the sauce tasted a bit burnt & the meatballs were not near as tender! Highly recommended, the food was amazing, great service, I was in shock over how reasonable the bill was. why they have yet to realize that none of the pizzas are well balanced in flavour is confusing beyond belief. nothing is fully developed as far as food goes. i continue to wish that they put as much thought into the food as they did the gorgeous decor. aside from that the service was impeccable and as always the wine was amazing. We were visiting Nelson for the first time, and it happened to be New Year’s Eve when we ate here. Despite the fact that it was busy on a lively evening, they did a great job providing a high level of service, and fantastic food as well. I definitely recommend if you’re in the area! we love the GF pizza here . it's delicious! we had the funghi pizza. I was disappointed by the quality of starter and main dish. Service was great and waiters and waitresses were very nice and friendly and accommodating. The price for the quality of food was way too high! There is little or no sound mitigation, makes visiting awkward at 50% capacity. Delicious we were with a chef who’d been to Italy recently and he thought it was very authentic. He had no complaints loved everything. We were happy to see the menu had expanded to more pasta dishes although tough not to order pizza cause it’s just so good. Love the decor and friendly staff. The food was great, service was great, decor was beautiful. Fun, energetic atmosphere. Food was really good, ambience is great and service was pretty good overall. Ingredients were sourced from Italy. Had a great time with friends. Menu is a bit limited would be great if they expanded it. Very authentic neopolitan pizza. The pizza was sensational as were the meatballs and mushrooms, excellent ambiance and service. I took our Sales Team here for a celebration dinner and everyone enjoyed their drinks, food and service immensely! The attention to detail for the food and drinks is outstanding! Definitely worth the trip! Marzano is a jewel of delicious food and upbeat atmosphere. A fabulous addition to our city. Simply amazing! Delicious food and drinks made with quality ingredients. The service was excellent, the restaurant was clean, the atmosphere is set for an enjoyable time whether you are on a date or out with a group! Loved this place. This pizza was the closest I’ve had to Italian pizza since being in Italy. 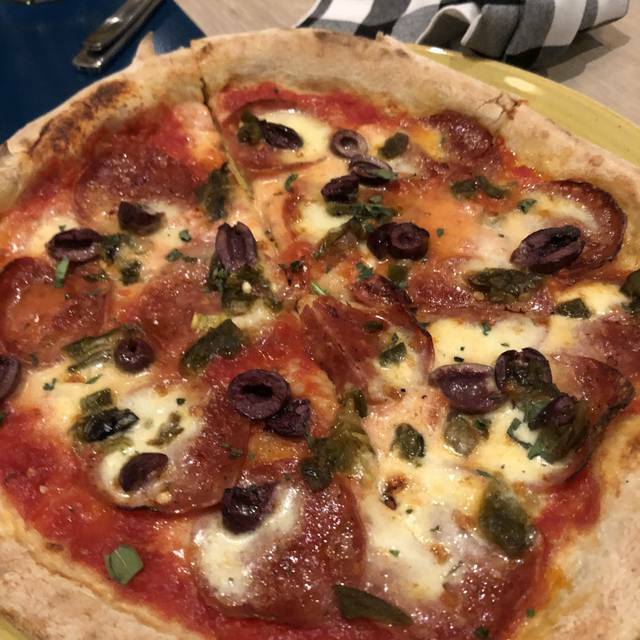 The only complaint is that they put too much cheese which makes it very oily and hard to eat since the crust is so flimsy and the toppings fall off. But still very tasty. The gnocchi is literally the best thing I’ve ever eaten in my entire life and I would get it again and again. The cocktails are also awesome. A group of 5 of us went to Marzano's on a Wed. evening. I booked through Open Table and later edited my reservation from 4 to 5 people. The folks at the restaurant seemed confused by this., but in the end it was fine. People in the group enjoyed their generously sized appetizers, especially the squid and burrata salad. Meals were well prepared and everyone enjoyed their choices. The servers were polite and seemed to be doing their best but they seemed to lack training and experience. Very good food, great service, love the modern chic decor! The food came quickly, even though we had ordered pizzas, pasta, and other dishes (well timed). We will definitely return, as we want to try some other items on this intriguing menu. Our first time here and it did not disappoint! Very modern and stylish interior! Love the pizza bar where you can sit and watch the pizzas being made and talk with the pizza chefs. The food is very tasty and the drinks are excellent! You will not be disappointed! We are definitely going back and soon! Yummy food and happy atmosphere. We were impressed with the good service though. Awesome! The pizza kitchen and pasta kitchen were not well coordinated, the pasta arrived way before the pizza. But our server was awesome and the food was so delicious! We were celebrating and the vibe was fun and festive. Loved this meal. Service superb! Just music was a little overwhelming. We needed a quieter table! Fabulous food in a modern and chic setting. You absolutely feel the effort put into making food that feels authentic not forced.